No matter how many books I read, I keep coming back to R.K. Narayan for yet another dose of his humorous satire, laden with rare pearls of wisdom, steeped in the humblest of real life situations. Yes, recently, I finished yet another novel of R.K. Narayan, ‘The Guide’ and the story was so interesting that I did not want to put it down, even after the novel has ended. The Guide tells the story of Railway Raju, a young fatherless boy, who is transformed from a lost-in-world jail convict into a holy saint without any conscious effort on his part. Destiny pushes him towards saintliness in the most unprecedented manner, and R.K. Narayan in his true style creates a wonderful tale brimming with love, treachery and faith. The story begins with Raju sitting somberly on a river bank, near Malgudi, contemplating his next move, as he has just come out of the jail after two years of punishment for fraud and forgery. As Raju stares vacantly, he is noticed by a villager ‘Velan’, who is impressed by the silent, wise man, and wants Raju to solve his problems. Raju is disarmed with Velan’s innocence and his own instincts to guide a lost man. By sheer coincidence, Velan’s problem is solved and he becomes a die-hard Raju loyalist. He invites his villagers to take shelter under the feet of country’s wisest and yet humblest holy man. One thing leads to another, and soon Raju Guide becomes famous as a wandering saint, who is venerated like a God among villagers, and gives them daily discourses citing mythological and allegorical stories. The villagers believe him to possess some kind of magical qualities, and place him on a high pedestal, expecting him to solve their small, myriad problems. For a few months, Raju enjoys his life as an anonymous saint, relishing the food and respect offered by villagers, and keeps himself busy with small children and adulating adults. However, one day, the villagers just stop coming, thereby forcing Raju to starve. He anxiously steps into the village, and sees that it is affected by the most dangerous droughts. His first instinct is to leave the place and move onto greener pastures, but, somehow, with some misunderstanding, he gets entangled in villagers’ problems, and is expected to fast unto death, to pacify the Rain God. Raju, who is corrupt to the core, is street-smart, knows how to fleece people for his petty benefits, is now tied with the innocent, expectant countrymen, who hail him as their savior and are ready to do anything for him. Will Raju be able to satisfy the villagers and the Rain Gods, or will he run away from the tricky situation, and return to his earlier life of falsehood and forgery is what the story is all about. The Guide with its 247 pages long narrative, is essentially a tale of human instincts, where faith and love can be expected to bring about a massive change in a man’s nature, capable of transforming a devil into saint. R.K. Narayan is at his best in this novel. He is sublimely funny, satiric and thought provoking at the same time. Within the limited spheres of a small town Malgudi, he once again fabricates an engaging, highly entertaining story. Narayan’s clever use of third person narration to tell the story of Raju the Saint and first person narration to talk about Raju’s past as a young restless boy, a careless son, a smart crook, a blind lover and an over clever event manager for his beloved Rosie was simply awesome. I always thought it was a cardinal sin to mix up the narrator in a story, as it confuses the readers. However, Narayan dispels all my doubts as the story oscillates between Raju’s past and present, with him adopting the changing garbs of an efficient manager, a jilted lover and a holier than thou saint easily, rapidly changing the narration from third person to first person. All thanks to the author’s well laid narrative, I was privy to Raju’s innermost thoughts and was laughing out loud at the foolishness of people, whom Raju took for an easy ride. He fleeced his believing customers, worldly unwise Marco, cunning Gaffur and ambitious Rosie, in his disarmingly charming style. And yet, Raju’s inner change becomes noticeable, when he begins to take his role as a saint seriously, really wishes to bring about a change in the lives of people, and is ready to sacrifice his own life for the betterment of villagers. As I said earlier also, while reading Bachelor of Arts, I had an inkling that the renunciation episode of Chandran was in a way responsible for creation of a fake saint in The Guide. And, I expected something on the lines of a loser trying to hide behind holy garbs theory in Guide as well. But, the story turned out to be quite different and impressed me more than I ever expected. The Guide is delightfully funny, and yet extraordinarily serious at the same time. I simply loved the contrasting nature of its characters, who struck me as real as Tagore’s characters, as neither Raju, nor Rosie or Velan are entirely black or white, they all have a mysterious grey shade and are blended well to chalk out a wonderful story of trust and betrayal. Though, I was not very satisfied with the climax, as Narayan leaves it dangling, with just a hint of the future events. But, all in all, it is a wonderful book and I have marked it prominently on my Read Again list. A true Guide to light up the paths of your life! The ending of the novel is not satisfactory and Raju’s part as a son is not fulfilled. Quite true, Indraja! The novel has an ambiguous ending, and I seriously felt that the climax let down the novel a bit. But, as I read some of Narayan’s other works, I found that he often leaves the end dangling in the middle. And, more than anything this gives him the liberty to expand the story further in a future story or novel. He even recreates his own characters and stories in different formats. Read Selvi for a different interpretation of Guide’s Rosy. So, whatever deficiencies I noted during my first read of Guide, Narayan slowly transformed those into new stories and novels, using his creative literary technique of keeping the readers mystified and hungry for more and more. great book!!!!!!! !But I wanna know who is the publisher? ?can anyone help me?? Hi Sadhna ! The book is published by Indian Thought Publications. The interesting fact is that this Publication was founded by R. K. Narayan himself and the first ever book published here was the famous Malgudi Days. Till date, it is managed by Narayan’s granddaughter. And the sole dustributor for this Publication is Indian Book House. 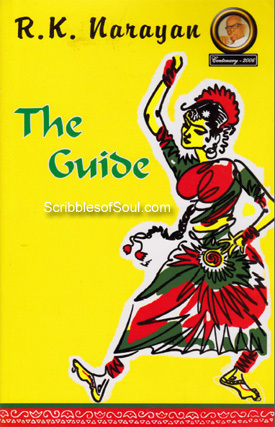 As a reader, I enjoyed the book The Guide which has been fabulously written by Mr. R.K. Narayan. His way of writing has impressed me a lot. This book is full of suspense. With every turning page, a new mystery is revealed. The context of words that has been chosen is magnificent. At times the story seems very perplexing, like Once Rosie agreed Raju’s proposal and spent time with him but some days later she started showing concern for her husband. Thus, its not clear what she was up to but its here only that the readers shall be willing to read further to reveal what will happen next. I loved reading this book as the plot which has been chosen for the story is a wonderful one. The characters, each one possessing a different kind of nature make the story extremely interesting. I would love to read more books of this type and strongly recommend this book to others. Truly, this book is worth reading. But can anyone give me summary. What is the message of this book. I really didn’t get it. Mariya it is easy to ride a tiger but impossible to get down. Once you come into public favor, or gain celebrity status, nobody not even you yourself can get away from that exalted position. That’s what happened to Raju the Guide.